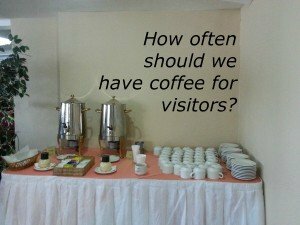 How often should churches have a visitor reception and serve coffee? Also, see to it that you follow the correct coffee beans and water proportion. Putting too much water and little coffee beans in the coffee maker will certainly yield a poor and “weak” brew. A general rule when brewing is to put 2 tablespoons of grounded coffee beans for every 6 ounces of water.